When I and my siblings were kids, we would often entertain ourselves with "car games" when traveling, which frequently centered around spotting the highest number of a particular item. As a youngster, the subject of the game was usually out-of-state car tags or in December it was almost always counting Christmas trees, which was very cool after sundown when we could see the twinkling tree lights in neighborhood houses. In Atlanta, spotting Coca-Cola signs, new and old, can provide hours of low-tech entertainment (or you might see who can take and post the most photos of Coke signs to Facebook on a single vacation). 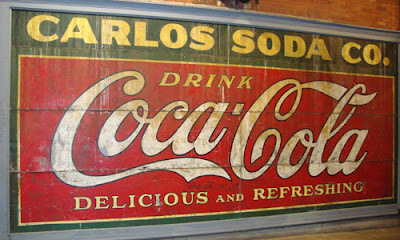 At the very least, it's an ongoing game...as the home of Coke's headquarters, Atlanta is filled with Coke signs. The sign in this photo is in Underground Atlanta, where there are quite a few throughout the location, which is a short drive to the World of Coca-Cola.